When I first met Barry Surplice of Henry Taylor tools, I was pretty sarcastic about toolmakers making tools for toolmakers instead of for carvers, so Barry, forthright as he is said, "OK then, tell me what you want," so I did and would you believe it, he listened! A trip to his modern factory in Sheffield was quite a surprise. The factory may have been very modern but what he has done is maintained the traditional method of manufacture - all carving tools are individually hand forged and finished. The much coveted Addis tools are replicated in the entire Henry Taylor brand, made in exactly the same way that they have always been. Some of the existing toolmakers were trained and worked with Addis himself and I believe that this shows. The tools are manufactured so fine and accurate, by eye, and it is a delight to watch. All the chisels are fitted with carver's pattern ash handles which are comfortable and are bright finished to slim shoulder thicknesses that makes tools an absolute delight to use. Woodcarving has two main branches: in the round and relief work. This kit is designed to be a starter for both these disciplines and can be expanded by the addition of specially chosen tools in either or both directions. For in the round work, the direction is generally with gouges of varying sizes and sweeps. The relief work naturally tends to be more with the grounding and V-chisels, again of varying sizes. These add-ons usually come as pairs but single chisels can be provided. This helps carvers build up the set in an affordable way and also gives relatives an idea of what can be sensibly and usefully bought as a gift. No.4 x 1in Fishtail Sweep - for general roughing out, fishtails allow the user to see better what they are doing, are light and also allow you to get into awkward corners. 3/16in x 90 degree V-tool - for drawing the outline onto the work from the pattern. The V is a very useful and underestimated tool for this. A 90 degree tool also allows a simple method of placing it on its side to tidy up the grounding and shoulders of the cut at the same time. No.9 x 3/8in fishtail gouge - a useful all round rougher, this size seems to follow from the No.4 and can remove material quickly and easily. 3/8in OH Boyd special design grounding tool - these tools were specially designed by me and are really two tools in one. The angles are the secret of this and they work over the top of detail in relief work, and by simply turning them over, they work under detail. These chisels are immensely popular with carvers and the smaller sizes for the awkward in the way places really do help the carver in a positive way. 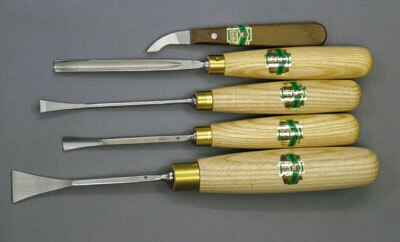 These chisels are also available as a separate set of six and have proved to be most popular as a separate set. Setting-in knife - this knife is designed to be used like a pencil and small, intricate designs that are awkward to get at with a chisel can be easily set-in and done with this tool. 2B pencil - what tool kit is complete without a pencil? An underrated tool and the softness of the 2B does not bruise the fibres of the wood when setting out the design, which of course is continuous and ongoing. Tool roll - a decent tool roll organises and protects the delicate edges and is entirely portable. "All the chisels are fitted with ash handles"